Pioneer uses only quality, archival materials in manufacturing, ensuring our products are photo safe: acid, lignin and PVC emission free. 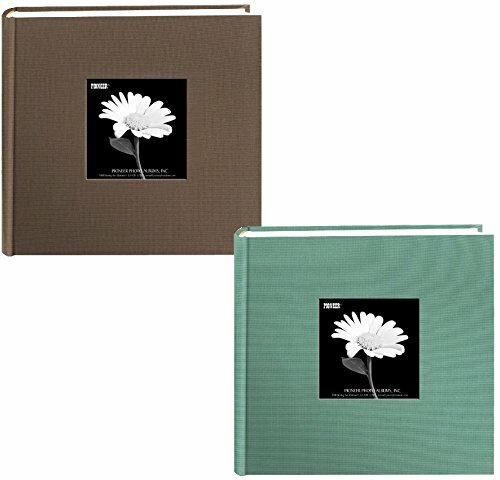 Pioneer offers many patented products including memo photo albums that feature optically clear plastic slip-in pockets and durable washable covers; Bi-Directional albums that allow photos to be vertical or horizontal on the same page; and top-loading memory scrapbooks in 5" x 7", 6" x 6", 8" x 8", 8" x 11", 12" x 12" and 12" x 15" that fit post-bound, 3-ring, and home party strap-style binding. Maven Gifts provides you with only the most durable and well-designed items. You can always rest assured that your items will come as expected, featuring high quality construction and well detailed designs. We take pride in our items and selection for you. We work hard to bring together your favorite items to make your shopping experience more convenient. Instead of spending countless hours looking for everything you need, get it all at once with Maven Gifts' single clicking, one stop shopping. USES ONLY QUALITY, ARCHIVAL MATERIALS: Pioneer uses only quality, archival materials in manufacturing, ensuring our products are photo safe: acid, lignin and PVC emission free. Pioneer offers many patented products including memo photo albums that feature optically clear plastic slip-in pockets and durable washable covers. ALLOW PHOTOS TO BE VERTICAL OR HORIZONTAL: Bi-Directional albums that allow photos to be vertical or horizontal on the same page; and top-loading memory scrapbooks in 5" x 7", 6" x 6", 8" x 8", 8" x 11", 12" x 12" and 12" x 15" that fit post-bound, 3-ring, and home party strap-style binding. MAVEN GIFTS: We work hard to bring together your favorite items to make your shopping experience more convenient. Instead of spending countless hours looking for everything you need, get it all at once with Maven Gifts' single clicking, one stop shopping.